An early start this morning, and the weather was brighter than forecast. Setting off at 6.15am I was parked up and making my way to the Circle Field behind Aberdour School, near Canons Farm. Almost immediately I heard drumming in the woods to the east of the field, and within minutes I was watching a male Lesser Spotted Woodpecker (105) drumming and calling near the top of a dead tree. It wasn't long before he flew off across the pathway to an oak tree in the adjacent field and then in the direction of the school. I bumped into local birder Paul Cox, who had seen the pair of Lesser Peckers yesterday morning and he explained how the male appeared to favour the end of the field where I saw it minutes earlier. Before long the drumming started up again and we made our way down the pathway and found the bird on a dead tree stump, drumming for all he was worth. 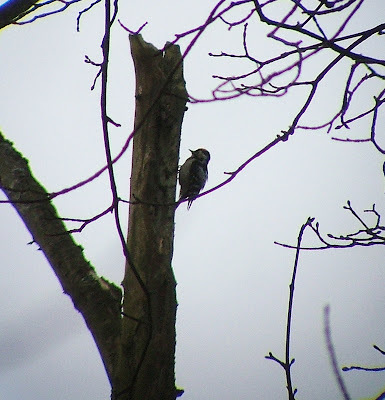 I couldn't really have asked for more for my first Lesser Spotted Woodpecker. All this and it was only about 7.30am. 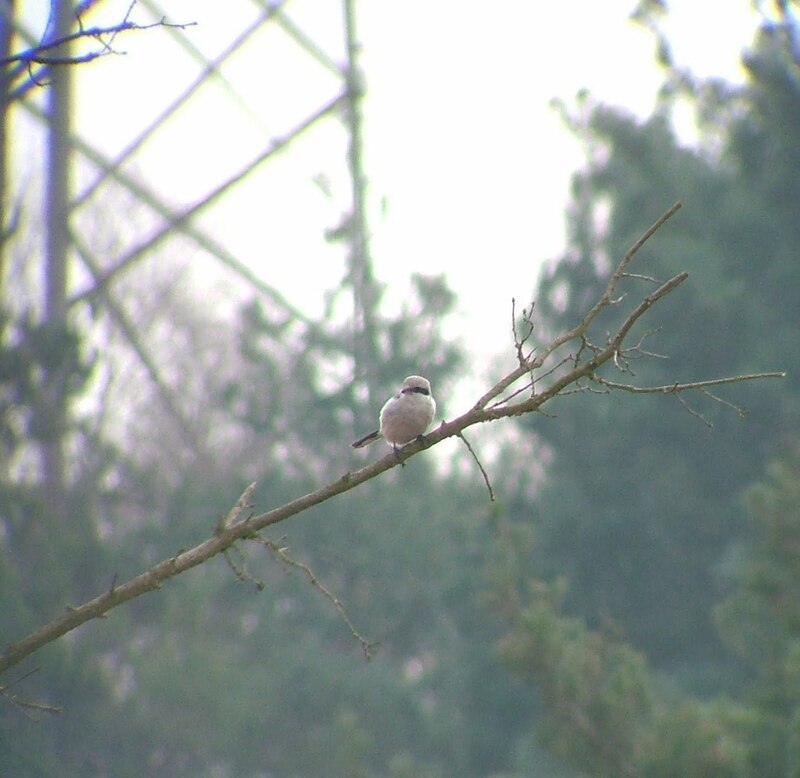 The Canons Farm/Banstead Woods patch has three pairs scattered around the area, but as the Farm's patch lister, David Campbell, mentioned in a comment posted on my blog recently, the Aberdour pair are the easiest to see. So, a great start to the morning. Next stop was Chobham Common. 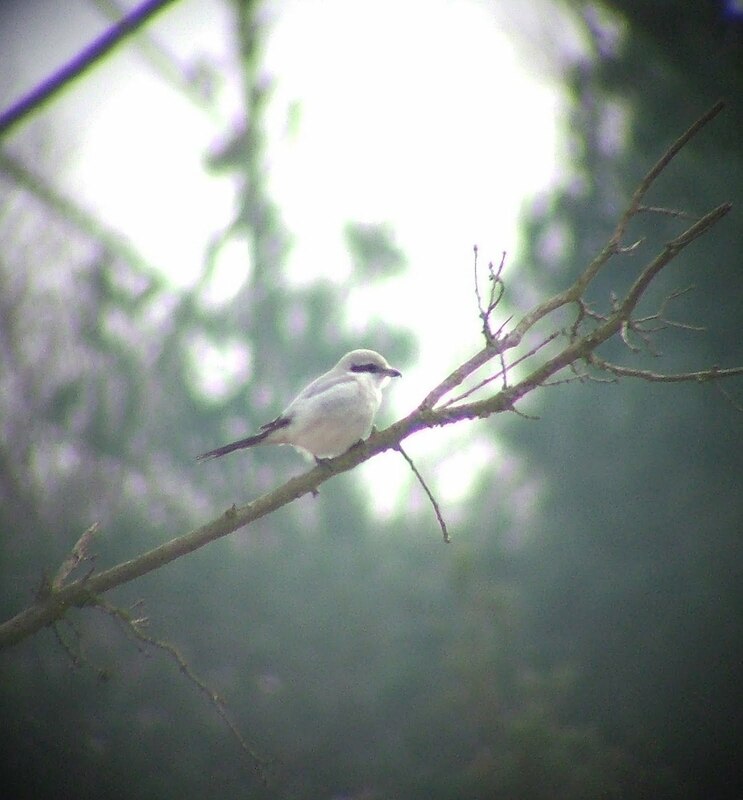 I wanted to get a half decent digiscope photo of the Chobham Common Great Grey Shrike, as this bird has been easier to see and follow than the Thursley Common bird(s), which tended to be more mobile and can fly a fair way off in a short time. Added to which Thursley is a tricky place to get around at the best of times due to the boggy terrain. I'd been at the usual spot, on the edge of the burnt area to the south of Jubilee Mound, but just couldn't find it - a couple of Woodlarks and a male Stonechat, but no Shrike. A local birder had also been searching for it, but it was looking like I was going to come away empty handed. 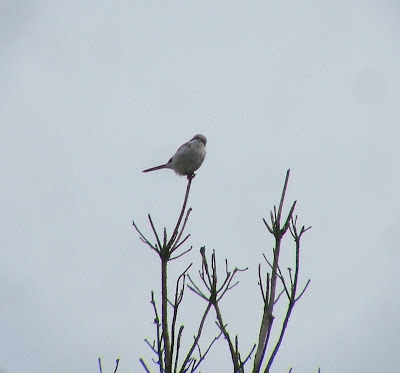 However, on another circuit of the area, the local chap had found it in a different place to its usual haunt, perched on a silver birch quite near the area where people fly their remote control airplanes. 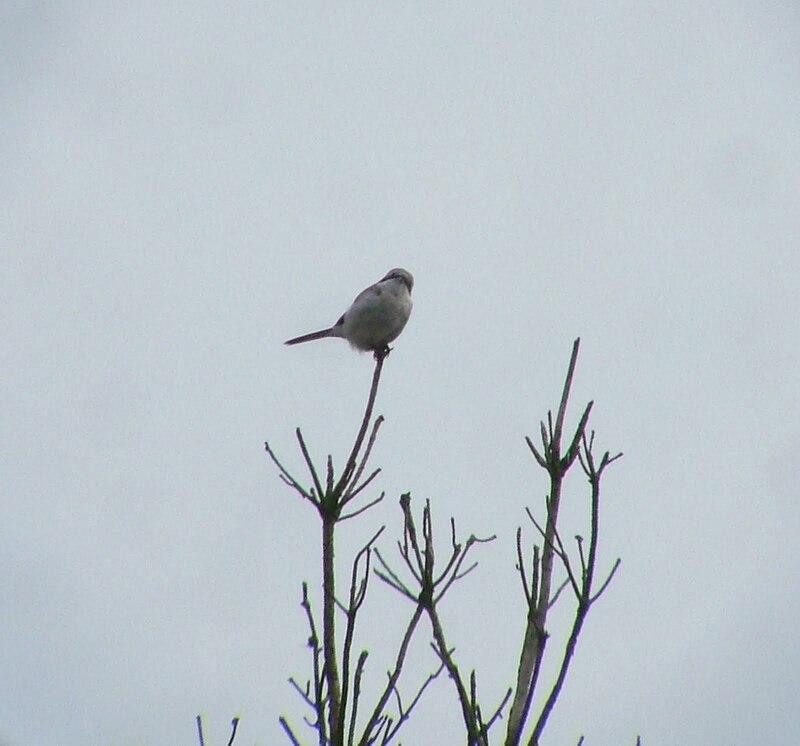 Once I knew where it was, I found the Great Grey Shrike without too much trouble. He eventually flew back to his usual spot, where he had a larder for his catch, mostly lizards (he went down to feed on one at one point), and for the next 90 minutes I followed the Shrike around as he flew from tree to tree. A brilliant bird. After that, I thought it only fair that I left him in peace for the rest of the day. The first Sand Martins have arrived around the Surrey area, and there have been a number of sightings of Red Kite, plus Little Ringed Plover and a Yellow Wagtail at Beddington. None of those mentioned has made its way to Holmethorpe as yet, but the coming week was the time last year when notable migrant arrivals, including Wheatear, dropped in. Having travelled around the county quite a bit recently it's time to return to the patch. Neil, I do enjoy reading your blog, following your and Graham James's blogs keeps me in touch with what's about ! I enjoyed your Waxwing adventures and thought the LSW might be similar! am jealous of your success with LSW I've missed it a few times. Thanks Geoff for your kind words. My success with LSW had no skill attached. Having flaffed around without even hearing a LSW drumming up until now, in the end with David Campbell's help I couldn't fail. As often happens with this hobby, once you've seen one, they will now turn up all time! If you try again, I reckon early morning is the best time.